1. 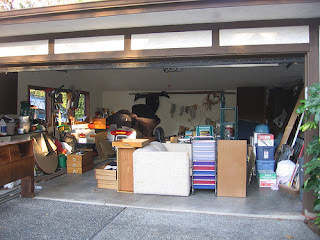 Identify the junk - We need to look long and hard at the things in our garage. Ask ourselves why are we holding onto them. Are we really going to use that again, are we really going to need a ten year old version of that ten years from now? I think we hold on to a lot of bitterness and anger this way, we think that we may need that old hurt to use on the one who hurt us. 2. Throw it out - Let it go man, just let it go. This is much easier after you have labeled it as junk. But it still requires effort. There are some things that you can easily bag up and set by the curb, and there are other things that are heavy and might require the help of some close friends. 3. Move the car inside - Let your poor garage fulfill its purpose in life. It lives for the car to pull in and to wrap its automatic door behind it. Let it be filled with all the goodness that comes when things are not just organized mess, but exactly as the builder intended. Now I know what your going to ask. Have I cleaned out my garage? Not yet, but as I pulled out of my driveway this morning I was looking into my garage and thinking it is time to organize it again already. Then God spoke to my heart and said stop organizing your junk, and just get rid of it. So, later today, I will go out to the garage and take step number 1. What will you do with your junk today.